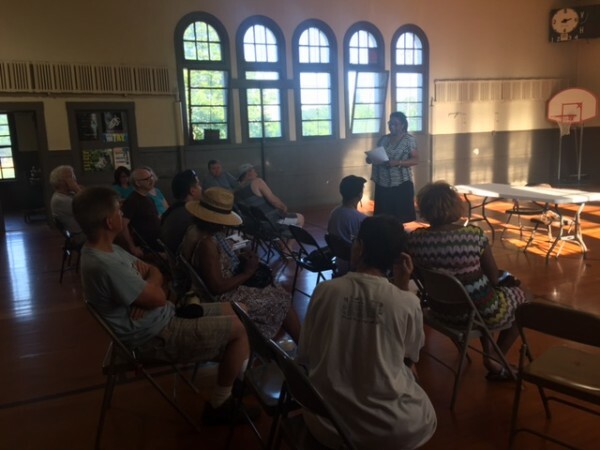 A 29th Ward community meeting was held last week at Rutherford Sayre Park where Austin residents were able to raise concerns about the neighborhood. Ald. Chris Taliaferro was not present due to conflicting events but his chief of staff, Pam Moore, was there to field questions from the audience. “My main job it to inform the residents about what is going on in City Hall,” Moore said. Although a light audience of only 12 residents were present, they brought up a few shared concerns. Moore said a common complaint was about the city’s handling of dead trees not being picked up. Moore said she wanted to answer as many questions as possible but avoided responding to questions she didn’t know the answer to. “I want to make sure I’m giving accurate information, but if I can’t answer a question I will inform the aldermen immediately,” she said. One resident spoke up about a local hookah shop on the 2900 block of Harlem Ave. that he noticed seemed to be attracting people after hours. A few residents also had complaints about local roads, sanitation procedures and vacant properties. According to data located on chicagobuildings.org which is compiled from the 311 reporting service, there have been 62 vacant or abandoned buildings reported in Austin since July 2015. The data also states that since Jan 1, 2010, there have been 18,949 vacant buildings reported in the city of Chicago. On average, 19 new buildings are reported every day. The next community meeting will be held July 6th at 6:30 p.m. at the Columbus Park Refectory. For more information, check the 29th Ward calendar here.